Barefoot Angie Bee: Birthday barefoot running! Yesterday, April 8th, I turned 34 and my son Milo turned 5 years old. I love that we share a Birthday! I ran 10 miles with the hubby and had a lovely time as always when running together. I took my Golite Rush Pack with me to carry nuun and shoes if I needed them. I ended up putting shoes on at 8.5 miles and then wished I wouldn't have stopped. It threw me off and I think my soles would have been fine for that last 1.5 miles. The shoes ruined my groove. Our 3 days of running came out to 29 miles for the week. Only 1.5 in shoes. When the terrain or our soles dictate, I wear the Evo IIs and Jaymon wears duct tape shoes that he makes. There are sweet duct tape styles and I keep bugging him to make me a pair out of the blue tie dye. I have a feeling that he has made the perfect shoe. I am pleased that my soles have not lost much toughness and my mind has adapted quickly to the intense sensations. The key is maintaining a gentle form. Despite what you might think, the bottoms of my feet are quite soft and not a huge callous. The weather has been lovely and its now time to start keeping my piggies painted and pretty. The season for testing out minimal running shoes seems to be at an end. To celebrate Milo's Birthday, I took him to run his first race! It was the local running clubs Loop the Lake 8k and a Little Lakers race for the kids. He has been talking about it all week and he so loved seeing all of the other kids. It was a bit chilly and foggy when we got there. He was mesmerized by the adult runners going so fast. It made me wish I would have raced too. It chokes me up every stinkin time to watch a race. Those people working so hard putting themselves out there. Its so good for them too. Love it! Why do I feel like sobbing when watching them dang it! Anyone else get choked up at races?? Milo wanted to put on his new Little Lakers race t-shirt to run. We left his crocs and socks on until right before the start. I could see people looking at his crocs with confusion. He already has typical adorable spring and summer feet that have walked miles already barefoot in our own yard. I think that the other parents, or maybe its just me, thought that the poor little barefoot boy should be wearing shoes. Little do they know... He pointed out that the other kids were wearing shoes. Interesting that he is now at the age to notice the differences between people and what they choose to do. I hope that I can instill in him the confidence to do things that work for him and make him happy regardless if its what the other people are doing. I have this subconscious notion that was instilled in me from childhood that barefoot is a sign of being "less than" both in wealth as well as intelligence. I think this is a common notion in our society. 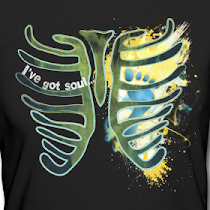 I would have felt more confident battling out my own inner contradictions if I would have worn my Barefoot Runners Society t-shirt or had my husband by my side to remind me that the beat of our own drum is the only one I can truly dance to. I would have felt really badass and confident if I would have raced barefoot but it didn't work out logistically with the spawn. Insecurities are not as profound when I am the one out running barefoot but when my child is judged or I perceive he is judged it brings back all of my own childhood memories and insecurities of being different. If anyone at that race should have been running barefoot it would be the kids. Their feet need freedom to grow and strengthen without restriction. To learn how their bodies work by tactile feedback. "But I can't run in them" is what I would whine at my mother when she would try and dress me up for church as a wee las. Oh how I frustrated that woman! I would always ditch the shoes. Now I do like to run in a dress but still ditch the shoes! The best I can do for my sons is to be an example to them. I am not going to buy them fancy cushioned bells and whistles running shoes when I myself don't wear them. We are all in charge of our own happiness. I want to show then how I find it and hope that by my example I will inspire them to find theirs too. Of course striving to better myself from the inside out means that taking my son to a race leads to questioning my reasons as well as my insecurities and duking it out internally. The upside is that I was not feeling down and out to be a year older! I feel more and more comfortable in my own skin and remember more often what is truly important to me even when I am not feeling so sure of myself. Milo was the youngest of his racing group and he kept up pretty well. He outran a few of the older kids. The look on his face while he was running was so cute. He gave it all he had! Most of all, he had fun! He got a medal and a t-shirt and he ran his first race and even ran it barefoot. He met some other kids and saw a bunch of dogs and a guy in a rubber ducky costume. I got to hang out with just my little Aries boy in the park on a strange foggy morning the day after our Birthdays. Lovely. I think it's awesome that Milo ran in bare feet. What a great beginning. My youngest daughter (age 10) is cool with being different and she is now in her 2nd pair of Vibrams. She even did a speech at school about them and her mother running around town bare foot. I was so honoured. I hope she doesn't change and that I've set an example for her that it's okay to just be yourself. On a whole different note, I thought it was only me that got choked up at races! I work in education and get choked up when the kids race. Watching marathons is especially hard. I feel such awe for the backrunners, the ones who have been slogging it out for hours because they are so determined. It's a moving experience. Good to know I am not the only one that gets choked up at races!! Outstanding! And a belated happy birthday to you both! feliz cumpleanos a ti y tu chico! He is a mini YOU! so cute! I probably would have choked up beside you. AND been barefoot, too. I love that we all share a birthday! 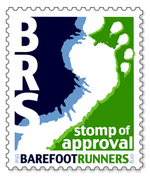 Curious - how did other runners react to Milo's barefootery? Were the other kids nice? Did parents give you a tsk tsk look? Or was everyone cool? Look at your hair! So pretty! I always get like that at races too, wishing I were the one running and getting teary. I get so excited for the runners there. At the Naked Foot 5k races we're going to I plan on having the kids run barefoot with us. You are such an awesome mama!!! Best way to celebrate both of your birthdays ever! I love that Milo ran barefoot. I get totally choked up at races. I get REALLY choked up watching videos of races, especially kids' races. No matter how hard I try to stay all cool about it, I always end up a big teary mess. Happy Birthday, Angie! And what a great way to spend it - running and with the family. Priceless! Little Ironman is like Milo and loves racing. He has been bugging me for months about when he can race again. I wish we could fast forward the kids' racing season. Josh, there was much silence....I think I saw some disapproving looks but nothing overt. I often find that other kids don't know how to react to my boys since they tend to be boisterous and friendly and want to play with everyone. Many kids seem highly stressed and that comes out being shy. I did talk to a couple that came to my talk on barefoot running I did a few months ago. He's so darn cute with his little feet out on display! Awesome that he got to do his first race. My daughter asked the other day if she could ride her bike barefoot. There was a time when I would have said no, but now it's yes of course! She told my hubs when he came home, "Mommy changed the rules." I am on a mission to make sure my kids grow up with healthy feet! Happy Birthday(s) to you...I love this about your fam!! That's so cool you have the same birthday! It's my birthday, too. Happy belated birthday, birthday sister! Happy belated birthday to you and your son! It's so much fun to do a race on your birthday. Glad Milo enjoyed his race. Glad the birthday celebrations went so well. You articulated your thoughts and feelings so well. It is harder when our children are out there being judged because of the choices their parents made. It all works out in the end and it adds to our confidence. Happy belated birthday to you and your son! I love that getting older doesn't bother you. It hasn't affected me yet either and I feel the same way, I'm just comfortable in my skin. Maybe so now more than when I was younger. What a great example you are to your son. We all just have to do what we think is best and not worry about what anyone else thinks. It's like that with lots of things in life but mostly about your beliefs. If you can show it by being barefoot, the other stuff will come through too. I get really emotional at races. I think for me it's just raw and real and nothing else. Everything's out there. Great post and I'm glad you had such a good run. I can't wait until my feet are like yours. Glad it was a good day for you both! What a little runner man, so exciting for him and you. All the best to the running family. happy birthday mommy and milo! omg, that is so neat that he ran barefoot espousing everything that you do and run. I don't think I'd be able to do it! I love that photo of you! You are blessed with happiness. It just seem to shine from you. I get choked up over otherrunners for sure. When I crossed the 50 mile finish line I though I would be crying or emtional but I wasn't. I was just so elated that I had been carried through the experience. I felt joy, almost giddiness. I liked that better than crying! You children amaze me. I think it has something to do with the love and support they get!